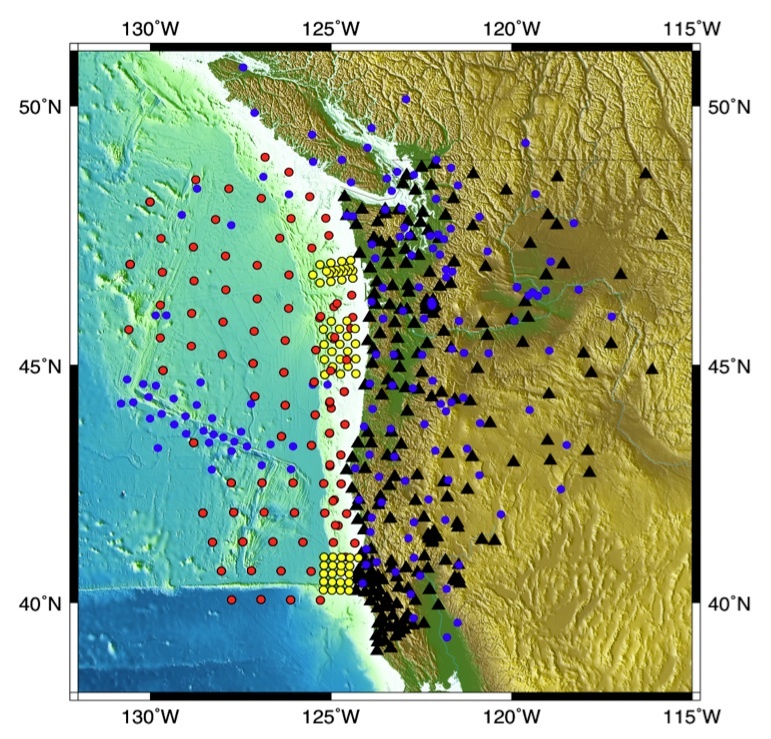 The Cascadia Initiative (CI) is an onshore/offshore seismic and geodetic experiment that takes advantage of an Amphibious Array to study questions ranging from megathrust earthquakes to volcanic arc structure to the formation, deformation and hydration of the Juan De Fuca and Gorda plates. The Initiative was featured in Vice President Biden’s list of “100 Recovery Act Projects that are Changing America” under the heading “Research to Avert Disaster: Understanding Earthquakes in the Pacific Northwest – Oregon, Washington, Northern California”. In October 2010, an open community workshop produced a series of recommendations to maximize the scientific return of the CI and to develop deployment plans for the offshore component of the experiment. The full workshop report can be found athttp://www.oceanleadership.org/2010/nsf-cascadia-initiative-workshop/. The science objectives of the CI are wide-ranging. The new instrumentation comprising the Amphibious Array will enable: real-time, high-rate GPS data to be used both for studying large earthquakes in the region and potentially for real-time seismic and volcanic hazard mitigation; continued monitoring of non-volcanic tremor along the entire subduction zone; imaging of the physical properties of the (offshore) megathrust; and studies of the Juan de Fuca and Gorda plates as they move from ridge to trench. 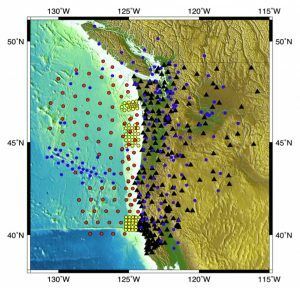 This diverse set of objectives are all components of understanding the overall subduction zone system and require an array that provides high quality data that crosses the shoreline and encompasses relevant plate boundaries. As part of the 2009 Stimulus or ARRA (American Recovery and Reinvestment Act) spending, NSF’s Earth Sciences (EAR) and Ocean Sciences (OCE) divisions each received $5M in facility-related investment. The funds were targeted toward the creation of an Amphibious Array Facility (AAF) to support EarthScope and MARGINS science objectives. The initial emphasis and deployment site was onshore/offshore studies of the Cascadia margin, with an expectation that the facility would later move to other locations. 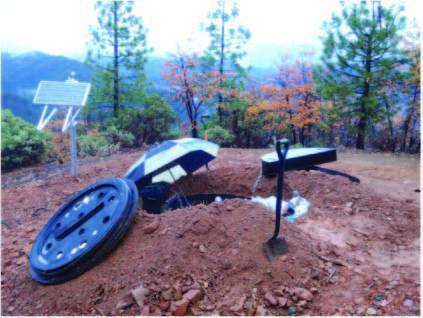 The ARRA funded upgrades to 232 Cascadia GPS stations that are part of the Plate Boundary Observatory that are being carried out by UNAVCO (Figure 1). The improvements include switching from daily downloads to continuous, real-time streaming of data, and increasing the rate of sampling from 30-second to 1-second epochs. The majority of these upgrades have already been completed; the project is on schedule and on budget. The remainder of the PBO stations will be completed by summer of 2011. The onshore seismic component of the AAF consists of 27 EarthScope/USArray/Transportable Array station sites that have been deployed to complement the existing distribution of broadband stations in Cascadia (Figure 1). Where possible and appropriate some of the 27 sites reoccupy the original sites of the Transportable Array in the region. In other cases new sites have been identified to complement existing stations and/or if the original site is not available. All 27 sites have a broadband velocity sensor and a strong-motion accelerometer and the deployments were completed in the summer of 2010 (Figure 2). All are operational with data streaming in near-realtime to the IRIS DMC, and will operate until at least September 2013. The data are archived at the IRIS Data Management Center. Stations report their data under the TA network code, and use the standard TA station naming convention. In addition, the Virtual Network Definition (VND) capability at the DMC provides a simple means to access these data. The virtual network “_CASCADIA” will provide access to the 27 TA stations plus 47 other broadband stations in the area, while the “_CASCADIA-TA” VND provides access to the 27 TA Cascadia stations. The CI funded the construction of a total of 60 Ocean Bottom Seismometers (OBSs) by the three Institutional Instrument Contributors (IICs) of the National Ocean Bottom Seismometer Instrumentation Pool (OBSIP). The IIC group at Lamont-Doherty Earth Observatory (LDEO) will build 30 OBSs, while the groups at the Scripps Institute of Oceanography (SIO) and the Woods Hole Oceanographic Institution (WHOI) will build 15 each. All 60 OBSs will be equipped with Nanometrics Trillium Compact seismometers. In addition to the seismometers, the SIO and WHOI OBSs will be equipped with Differential Pressure Gauges (DPGs) while the LDEO OBSs will carry Absolute Pressure Gauges (APGs). Twenty of the LDEO OBSs will be installed in trawl-resistant enclosures and will be available for deployments in water depths extending from the shelf down to 1,000 m. These 20 OBSs will be deployed via the ship’s wire and recovered using a Remotely-Operated Vehicle (ROV). These instruments will not be deployable in water depths greater than 1,000 m. The fifteen SIO OBSs will also be installed in trawl-resistant enclosures, and are deployable at depths extending from the shelf down to 6,000 m. The WHOI OBSs will not be deployable in depths shallower than 1000 m. All 60 instruments will be equipped with 12-month battery packs. The OBSs will be utilized in four one-year deployments. These experiments will provide an offshore extension of the EarthScope Transportable Array (~70 km spacing) as well as 3 dense experiments focused on either imaging various properties of the thrust interface and forearc or recording local seismicity (Figure 1). The OBS deployment geometry complements the cabled observatories of NEPTUNE Canada and the Regional Scale Nodes of the Ocean Observatory Initiative as well as funded, PI-driven OBS experiments designed to study deformation near the Blanco Transform and within the Gorda Plate. The proposed deployment plans are described in detail in the workshop report. A team of PIs will lead expeditions to deploy and recover CI OBSs and to develop Education and Outreach modules. The team is being organized by Doug Toomey and includes Richard Allen, John Collins, Bob Dziak, Emilie Hooft, Dean Livelybrooks, Jeff McGuire, Susan Schwartz, Maya Tolstoy, Anne Trehu and William Wilcock. The PI team is knowledgeable about the science and operational objectives of the CI, includes individuals with chief scientist experience, ones who have not yet been to sea and representatives from both the EAR and OCE communities. It is anticipated that there will be berths for students, post-docs and other scientists to participate in either deployment or recovery legs, thus providing the seismological community with opportunities to gain valuable experience in planning and carrying out an OBS experiment. Funding and ship time for the deployments and recoveries of OBS will be supported primarily by the Ocean Sciences Division of NSF. The CI has a finite duration with the intention that both the onshore and offshore components of the AAF will move to other locations following the completion of the CI. The community plan resulting from the October workshop requires four years of onshore/offshore deployments in Cascadia, which will begin in the summer of 2011. The four one-year OBS deployments in the region would last until the summer/fall 2015 at which point the AAF could move to a new location, or could remain in Cascadia. The October workshop recommended that during the four years, smaller workshops should be held to evaluate data quality, present results from initial analyses, and make adjustments to the deployment plan if necessary. A process is also needed to decide where the AAF should be deployed following the initial 4-year deployment in Cascadia. In the context of the ongoing EarthScope initiative, possible locations include the East Coast, the Gulf of Mexico, and Alaska. However, the AAF could also move to other locations or remain in Cascadia. A community workshop in 2014 was therefore proposed as a venue to decide on the next deployment of the AAF.